While most manufacturers design wigs to fit average sized heads, Motown Tress has developed a line of wigs that fit small to extra large size heads. Motown Tress, a manufacturer of human hair and synthetic hair wigs, has been designing hair products for more than two decades. A large variety of their products can be found on http://www.hairstopandshop.com, which is a major online retailer for hair wigs and hair weaves. Just recently, Hair Stop and Shop has added Motown Tress flex wigs, which comfortably fit from petite size head to extra large. Compared to a regular wig, which only stretches in one direction, a flex wig stretches in all directions, thus able to cover a larger area. 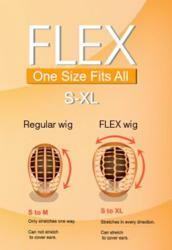 Customers, who have fitting problems with regular cap wigs, experience no difficulty with the flex wigs. About Motown Tress: Motown Tress is well known among consumers for their line of Flex wigs, Simple Cap wigs, Lace Front wigs, Fine Mono wigs and Half wigs. Watch the video link for a brief illustration of their product lines. About Hair Stop and Shop Inc: HairStopandShop.com offers a variety of hair products as well as popular brands. Online customers can find lace front wigs, weaves, clip-in extensions, braids and hair pieces. Hair Stop and Shop’s selection of brands include: Motown Tress, Janet Collection, Model Model, Harlem 125, Isis Collection, Femi Collection and Silhouette.